Her er til gengæld en udredning, der ikke hjælper i så henseende! TV2Vejret: 57 omkommet af hedeslag i Japan (27/7-10) De mennesker ville sikkert stadig være i live hvis fagfolk kunne læse termometeren rigtigt. MONGABAY: Record highs, forest fires, and ash-fog engulf Moscow (27/7-10) Alarmisterne påstå bl.a. at afgrøderne lider og luften forurenet. - javist, det er der øjensynligt osse rigtigt mange, der påskønner! (4838) Interessant holdning til solfysik! "WUWT reached a new milestone with 50 million unique hits"
Klimamodeller, som forskere bruger til at simulere fortidens og fremtidens klima med på supercomputere, er for dårlige. Resultaterne bliver snart offentliggjort i det videnskabelige tidsskrift Geophysical Research Letters. De kan nemlig ikke genskabe fortidens voldsomme klimaskift - de såkaldte 'tipping points' - og kan derfor heller ikke bruges til at forudsige markante klimaændringer i fremtiden. Klimaforskere forventer, at fremtiden med garanti vil byde på tipping points, hvis vi bliver ved med at poste CO2 ud i atmosfæren i samme tempo som nu. Forskerne har altså reelt ikke noget værktøj til at forudsige præcis hvornår det næste tipping point vil finde sted, og det svarer til at køre hen mod en afgrund med høj fart med bind foran øjnene. (378) Solenergi er billigere end atomkraft! En undersøgelse viser at prisen på solenergi er faldet betydeligt og nu er billigere end energi fra atomkraft. - det må dog vel i høj grad afhænge af, hvor anlæggene placeres? : Fx. på Peary Land ville jeg tro, at solenergi ville få problemer med rentabiliteten - på helårsbasis, 'tihvertifald'! Jeg forstår ikke sammenligningen. Hvis bilen er jorden i sin bane om solen, hvad er da vejtræet? En komet? Det var ikke en asteroide, kun en metafor. Klimaet har tre grund-tilstande: Varm mellemistid, Kold istid og Koldere istid. Da vi har en mellemistid så skulle en opvarmning måske kunne udløse en afkøling. Og sandsynligheden for dette Svare til sandsynligheden for at falde i en afgrund når man køre stærkt med bind for øjnene. An expanded network of boreholes across the northern hemisphere has confirmed that permafrost throughout polar and sub-polar regions is thawing, say scientists who studied the topic during International Polar Year. "You look at a whole hemisphere and see the patterns everywhere," said Vladimir Romanovsky, a professor with the snow, ice and permafrost group at the University of Alaska Fairbanks Geophysical Institute, and lead author of a paper documenting the research. Romanovsky and his colleagues launched a campaign to improve the global network of boreholes for International Polar Year, a science program focused on the Arctic and Antarctic that ran from 2007 to 2009. Boreholes are holes drilled anywhere from 6 feet to over 200 feet into the ground and equipped with sensors to allow scientists to measure soil conditions. The researchers established nearly 300 boreholes, nearly doubling the existing network. The speed that permafrost The thaws is important for Alaska and the world. Not only does thawing permafrost affect regional ecosystems, change landscapes and wreak havoc on infrastructure; it's also an important player in the overall picture of climate change. Permafrost contains a vast amount of carbon, which scientists believe could seep into the atmosphere as methane as it thaws, and send already-rising temperatures even higher. What Romanovksy and other scientists don't know yet is how fast the permafrost will thaw. If there is a significant delay as permafrost approaches 0 Celsius, for example, it could be good "because it will give us more time to react," Romanovsky said. However, that lag time could also mean that the warming will accelerate after the temperatures hit 0 degrees. During the descent into the recent `exceptionally' low solar minimum, observations have revealed a larger change in solar UV emissions than seen at the same phase of previous solar cycles. This is particularly true at wavelengths responsible for stratospheric ozone production and heating. This implies that `top-down' solar modulation could be a larger factor in long-term tropospheric change than previously believed, many climate models allowing only for the `bottom-up' effect of the less-variable visible and infrared solar emissions. We present evidence for long-term drift in solar UV irradiance, which is not found in its commonly used proxies. In addition, we find that both stratospheric and tropospheric winds and temperatures show stronger regional variations with those solar indices that do show long-term trends. A top-down climate effect that shows long-term drift (and may also be out of phase with the bottom-up solar forcing) would change the spatial response patterns and would mean that climate-chemistry models that have sufficient resolution in the stratosphere would become very important for making accurate regional/seasonal climate predictions. Our results also provide a potential explanation of persistent palaeoclimate results showing solar influence on regional or local climate indicators. The work presented here is consistent with the interpretation of a recently reported effect  of solar variability on the North Atlantic Oscillation (NAO) and European winter temperatures over the interval 1659–2010 in terms of top-down modulation of the blocking phenomenon [52, 53]. In fact, Woollings et al  show that the solar response pattern is, despite being similar in form to that of the NAO, significantly different in that it reaches further east. These authors also show that open solar flux has a much stronger control over blocking events in this sector than the previously reported effect of F 10.7 . There is seasonality in the solar responses reported here. This is expected as modulation of upwards-propagating planetary waves in wintertime, and the associated stratosphere–troposphere interaction, is most widely believed to be the key mechanism [8, 11]. In addition, the tropospheric signature is a response of the eddy-driven jet streams, and these are at their strongest and most responsive in winter. While the results are presented here as annual means, the regression analysis was actually carried out on monthly mean data and thus takes this seasonality into account. The seasonal evolution of the F 10.7 cm flux regression was described in detail by Frame and Gray  and this was not significantly affected by using either the open solar flux FS nor the cosmic ray flux, M, instead of F 10.7. The relationship between the open solar flux FS and UV spectral irradiance changes inferred here provides an explanation of why the open solar flux was a valuable proxy for solar activity in the recent studies by Lockwood et al  and Woollings et al . In addition, FS is correlated with other parameters such as the level of geomagnetic activity and solar wind dynamic pressure and a relationship with UV variability may be responsible for persistent reports of a relationship between these phenomena and the NAO [56–59]. This is a much more satisfactory explanation than any causal link, for which the unexplained amplification required would be massive (the energy density of the solar wind being smaller than the TSI by a factor of order 105 and the currents that it generates, and that cause geomagnetic activity and heating, are in the upper atmosphere where the mass is of order 10 – 3 of the total atmospheric mass). Furthermore, FS is highly anticorrelated with cosmic ray fluxes reaching Earth on a wide range of timescales . This makes any relationship of FS with UV emissions and top-down solar forcing a relevant factor in the considerable debate about reported correlations between climate (in particular global or regional cloud cover) and GCRs. Indeed some authors have noted that apparent solar cycle variations in cloud cover are in better agreement with the UV irradiance variation than that of GCRs [61–63], although we note that other studies that have tried to discriminate between electromagnetic irradiance and direct cosmic ray effects do find some evidence for the latter [64, 65]. A great many palaeoclimate studies have found links between regional or local climate indicators and cosmogenic isotopes and so it has been argued that this is either evidence for a direct cosmic ray effect or that the cosmic rays are proxy indicators for the correlated irradiance variability . In particular, the much cited and much debated paper by Bond et al  revealed a persistent correlation during the Holocene between ice-rafted debris in the North Atlantic region and cosmogenic isotopes. The results presented here and in the recent paper by Woollings et al  suggest that solar UV variability and top-down solar forcing can introduce regional changes in the troposphere in the region studied by Bond et al and that these may vary on centennial timescales, as recently reported in the Central England temperature records by Lockwood et al . The implication is that seasonal/regional evaluation of past and future climate change will be improved by models with adequate resolution in the stratosphere to reproduce top-down solar forcing. Regionale klimavariasjoner som for eksempel den lange tørkeperioden i USA på 1930-tallet, hetebølger i Europa de siste årene og variasjoner i styrken på tropiske orkaner knyttes til temperaturvariasjoner i Atlanterhavet. Årsakene til temperatursvingningene i havet er imidlertid dårlig kjent. Tidligere har forskere antatt at klimavariasjoner i Atlanteren over tiårsperioder skyldes endringer i store havstrømmer. Nå viser klimaforskere fra UiB, Uni-Bjerknessenteret og Nansensenteret at også eksplosive vulkanutbrudd påvirker temperatursvingninger i Nord-Atlanteren. The hiatus of global warming in the Northern Hemisphere during the mid-20th century may have been due to an abrupt cooling event centered over the North Atlantic around 1970, rather than the cooling effects of tropospheric pollution, according to a new paper appearing September 22 in Nature. The different rates of warming in the Northern and Southern Hemispheres in the middle 20th century are frequently attributed to the larger buildup of tropospheric aerosol pollution in the rapidly industrializing Northern Hemisphere. Aerosol pollution contributes to cooling of the Earth's surface and thus can attenuate the warming due to increasing greenhouse gases. But the new paper offers an alternative interpretation of the difference in mid-century temperature trends. "The suddenness of the drop in Northern Hemisphere ocean temperatures relative to the Southern Hemisphere is difficult to reconcile with the relatively slow buildup of tropospheric aerosols," Thompson said. - jøsses dog for en 'forklaring'! : Det viser sig nok at ha' været 'den afskyelige snemand', der på netop dét tidspunkt fik behov for en dukkert! - yep, det er i sandhed hårde tider for alarmisterne! - her er en længere gennemgang/vurdering af artiklen. Jeg vil især fremhæve Carl Wunsch's interessante synspunkter, nederst i artiklens tekst. "Specielt de seneste 10-12 år er sommertemperaturen i Grønland steget. Vores beregninger viser, at afsmeltningen i sommer har været større end nogensinde"
- javist, Mernild igen (igen)! ('Pick your choice'/'choose your pick'! (1023) Og medens det stadigvæk er aktuelt "Glædelig Jul" allesammen !!!! Gu' ved om der ligger de samme fejltagelser bag 'klima-religionen' ? (5723) Rick, Kosmos, ja, take your pick. Her ét stk peer reviewed undersøgelse hvor vi (igen-igen) kan konkludere at vi det meste af den holocene periode har haft et varmere Arktis end vi har idag. Her en illustration af antal måneder per år med mere end 50% havisdække i det Arktiske hav. JP´s artikel der vist siger noget i retning af "størst afsmeltning nogensinde" må altså mene at de ved bedre end studier som ovenstående (fra KBH universitet?). Dertil kommer jo det groteske, at går man tilbage blot til 1925-45, ja så havde vi lige så høje temperaturer på Grønland som idag i dekader. Og som jeg har spurgt til rigtigt mange gange: Hvorfor estimerer visse forskere at isen idag må afsmelte så meget mere end i 1925-45 perioden? Har temperaturer en kraftigere effekt på isen idag end f.eks 1925-45? Men skidt pyt, det er jo bare data fra virkelighedens verden. It is important to note that the amplitude of these millennial-scale changes in sea-surface conditions far exceed those observed at the end of the 20th century. 450 kubikkilometer. Er det tal baseret på solid forskning, må man acceptere det. Jeg mangler blot en præcicering af, om tallet går på nettotabet eller på afsmeltningen. "... the last part of the 'Medieval Climate Anomaly' (here the period between ca. AD 1032 and 1262), the chironomid-inferred mean July air temperatures were 1°C warmer than the climate reference period (1961-1990)," which would also make them warmer than most subsequent temperatures as well. And in looking at their graphs of 20- and 50-year running means, it can be seen that the peak mean warmth of the Medieval Warm Period exceeded that of the Current Warm Period by approximately 0.5°C in the case of 20-year averages and 1.2°C in the case of 50-year averages." (75) Mernild er på banen med forskellige tal for afsmeltningen fra Grønland i forskellige medier. Forvirringen breder sig. "Glacier Ice Loss Less Than Thought"
The United States and many other heavily populated countries face a growing threat of severe and prolonged drought in coming decades, according to a new study by National Center for Atmospheric Research (NCAR) scientist Aiguo Dai. The detailed analysis concludes that warming temperatures associated with climate change will likely create increasingly dry conditions across much of the globe in the next 30 years, possibly reaching a scale in some regions by the end of the century that has rarely, if ever, been observed in modern times. "We are facing the possibility of widespread drought in the coming decades, but this has yet to be fully recognized by both the public and the climate change research community," Dai says. "If the projections in this study come even close to being realized, the consequences for society worldwide will be enormous." Dai is the first to bring regional details and specific numbers to the general observation of the 2007 assessment of the United Nations Intergovernmental Panel on Climate Change that mid-latitude regions will become drier in the years ahead as precipitation zones migrate to higher latitudes. Another noted climate specialist, Richard Seager, of Columbia University's Lamont Doherty Earth Observatory, observed: "The term 'global warming' does not do justice to the climatic changes the world will experience in the coming decades. Some of the worst disruptions we face will involve water, not just temperature." Most climate models have suggested that evapotranspiration, which is the movement of water from the land to the atmosphere, would increase with global warming. The new research, published online this week in the journal Nature, found that's exactly what was happening from 1982 to the late 1990s. But in 1998, this significant increase in evapotranspiration -- which had been seven millimeters per year -- slowed dramatically or stopped. In large portions of the world, soils are now becoming drier than they used to be, releasing less water and offsetting some moisture increases elsewhere. Due to the limited number of decades for which data are available, scientists say they can't be sure whether this is a natural variability or part of a longer-lasting global change. But one possibility is that on a global level, a limit to the acceleration of the hydrological cycle on land has already been reached. If that's the case, the consequences could be serious. Issued annually, the Arctic Report Card is a timely source for clear, reliable and concise environmental information on the state of the Arctic, relative to historical time series records. Some of the essays are based upon updates to articles in the Bulletin of the American Meteorological Society State of the Climate in 2009. Material presented in the Report Card is prepared by an international team of scientists. The Arctic Report Card is collaboratively supported by the international Arctic Council. The Conservation of Arctic Flora and Fauna (CAFF) Circumpolar Biodiversity Monitoring Program (CBMP) provides collaborative support through the delivery and editing of the biological elements of the Report Card. The audience for the Arctic Report Card is wide, including scientists, students, teachers, decision makers and the general public interested in Arctic environment and science. The web-based format facilitates future timely updates of the content. Globally. Opposite of last year, the globe will be cooling considerably and temps by spring should be running near or below normal. This trend will probably make 2011 the coolest year since the late 1990s. Arctic sea ice will continue to recover from the 2007 lows, with the summer ice melt season next year probably returning ice to pre-2006 levels. (Joe's column and graphics are © AccuWeather, Inc. Redistribution in whole or in part is prohibited.) - YIKES! The fear that global temperature can change very quickly and cause dramatic climate changes that may have a disastrous impact on many countries and populations is great around the world. But what causes climate change and is it possible to predict future climate change? New research from the Niels Bohr Institute at the University of Copenhagen shows that it may be due to an accumulation of different chaotic influences and as a result would be difficult to predict. "We have made a theoretical modelling of two different scenarios that might trigger climate change. We wanted to investigate if it could be determined whether there was an external factor which caused the climate change or whether the shift was due to an accumulation of small, chaotic fluctuations," explains Peter Ditlevsen, a climate researcher at the Niels Bohr Institute. He explains that in one scenario the climate is like a seesaw that has tipped to one side. If sufficient weight is placed on the other side the seesaw will tip -- the climate will change from one state to another. This could be, for example, an increase in the atmospheric content of CO2 triggering a shift in the climate. In the second scenario the climate is like a ball in a trench, which represents one climate state. The ball will be continuously pushed by chaos-dynamical fluctuations such as storms, heat waves, heavy rainfall and the melting of ice sheets, which affect ocean currents and so on. The turmoil in the climate system may finally push the ball over into the other trench, which represents a different climate state. Peter Ditlevsen's research shows that you can actually distinguish between the two scenarios and it was the chaos-dynamical fluctuations that were the triggering cause of the dramatic climate changes during the ice age. This means that they are very difficult to predict. But what about today -- what can happen to the climate of the future? "Today we have a different situation than during the ice age. 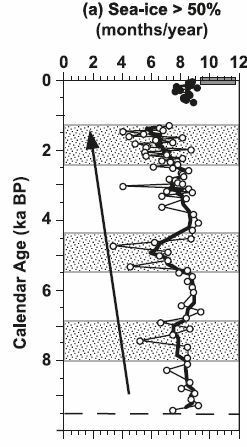 The Earth has not had such a high CO2 content in the atmosphere since more than 15 million years ago, when the climate was very warm and alligators lived in England. So we have already started tilting the seesaw and at the same time the ball is perhaps getting kicked more and could jump over into the other trench. This could mean that the climate might not just slowly gets warmer over the next 1000 years, but that major climate changes theoretically could happen within a few decades," estimates Peter Ditlevsen, but stresses that his research only deals with investigating the climate of the past and not predictions of the future climate. Melt water flowing through ice sheets via crevasses, fractures and large drains called moulins can carry warmth into ice sheet interiors, greatly accelerating the thermal response of an ice sheet to climate change, according to a new study involving the University of Colorado at Boulder. The new study showed ice sheets like the Greenland Ice Sheet can respond to such warming on the order of decades rather than the centuries projected by conventional thermal models. Ice flows more readily as it warms, so a warming climate can increase ice flows on ice sheets much faster than previously thought. Conventional thermal models of ice sheets do not factor in the presence of water within the ice sheet as a warming agent, but instead use models that primarily consider ice-sheet heating by warmer air on the ice sheet surface. In water's absence, ice warms slowly in response to the increased surface temperatures from climate change, often requiring centuries to millennia to happen. Se også: EUREKALERT: "Water flowing through ice sheets accelerates warming, could speed up ice flow"
"The fact that the ice temperatures warm rather quickly is really the key piece that's been overlooked in models currently being used to determine how Greenland responds to climate warming," Steffen said. "However, this process is not the 'death knell' for the ice sheet. Even under such conditions, it would still take thousands of years for the Greenland ice sheet to disappear, Steffen said. - nå jeg troede ellers, det nu hed climate disruption? Eller måske inadvertent weather modification?? Ja, jeg har også lagt mærke til at klima forskning er ikke som matematik - 100% rigtigt eller 100% forkert! Jeg gik ud for at det ligger i sagens natur - at forskning ligger ved grænsen af hvad vi ved og billedet klargøres langsomt. stigning i globalt midlede temperaturer siden midt i det 20. Hvis det var "meget sandsynligt" at jeg ville ikke når frem til arbejde i live i morgen på min cykel ville jeg ikke tage afsted. Også hvis det var 'kun' 90-95% sandsynligt at jeg ville når frem i live ville jeg nok tænke mig godt om. Vi kan håndtere og vurdere sandsynligheder i dagligdagen. Hvorfor ikke i klima/miljø området?? Jeg er mere end 95% sikker paa at fremtidige klimaforudsigelser er mere end 95% usikre. CO2 er gaaet op med mere end 20ppm siden 1998 men temperaturerne har ikke fulgt med. De er paa vej ned igen p.g.a. La Nina. Der maa vaere naturlige "forcings" der er staerkere end CO2 - maaske meget staerkere. Se paa globale vandstande. De er ogsaa paa vej ned igen. Og soeisen rundt om Sydpolen klarer sig ogsaa godt. Naar det gaar ned nordpaa saa gaar det op sydpaa. De er nogenlunde i balance og indenfor naturlige svingninger. Hvor er den katastrofale effekt af CO2? Det er maerkeligt at det altid er i fremtiden og helst efter 40-50 aar hvor dem der leger med computers cannot be held resposible for their mistakes. Have fun with your predictions. I prefer to look at real events. Den der med Groenlands is er ogsaa en skroene. Jeg kan huske at med den nutidige smeltning ville det tage ca. 14,000 aar for Groenlands is at smelte og til den tid er der nok 4 Km is over Koebenhavn. Have fun with your predictions. Interessant valg af årstal. Nu må vi se hvis den 30 årig tendens fortsætter efter denne la Nina dyk . Se paa globale vandstande....De er ogsaa paa vej ned igen. Ja det går op og ned. Ned for tiden men mest op. Naar det gaar ned nordpaa saa gaar det op sydpaa. De er nogenlunde i balance og indenfor naturlige svingninger. Bare rolig. Ændringerne er bygyndt så småt at komme igang. Se HER HER. katastrofal er et ret subjektiv ord. Det er en af benægternes ynlings "stråmænd" at sige at klimaforskere lover "umiddelbart forestående katastrofale effekter" (imminent catastrophic effects) og derefter gøre os opmærksomme på at verdens undergang er ikke kommet endnu. Al Goore og ICCP har ellers fået FN's freds-pris for at redde jorden. Har du ikke set hans film? Har du ikke læst James Hansen's bog? "Something to be thankful for! At last: Cosmic rays linked to rapid mid-latitude cloud changes." Det er ikke Svensmark, der står bag omtalte projekt, men jeg er lidt forvirret mht. hans Cloud eksperiment, er det afsluttet eller ej? Synes det blev sagt, på et eller andet tidspunkt, at samarbejdet var afbrudt, men synes så også, at det blev sagt, at det ikke passede...? Nogen her der ved det? Svensmark og DTU/SPACE har afbrudt samarbejdet med CERN/CLOUD. Det har vist sig at DTU/SPACE ikke behøver accelleratoren for at udføre deres eksperimenter. CERN/CLOUD skulle barsle med en rapport om cosmic rays indenfor en overskuelig fremtid.